In this tutorial I will show you how to provide a dynamic RTF document on your website generated with data from your database. For this tutorial you will need Microsoft Word or WordPad, WhizBase and Microsoft Access. First you need to make an RTF template, it is how the document will look like. 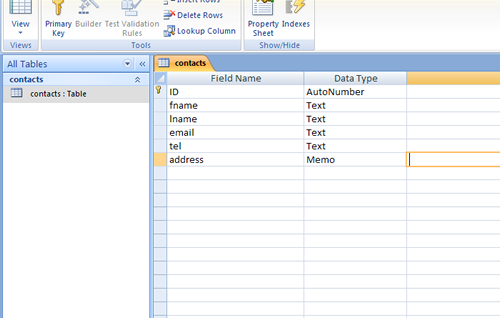 I have created a file which lists the first name, last name, telephone, email and address in a table. As you can see the dynamic part will contain WhizBase code. 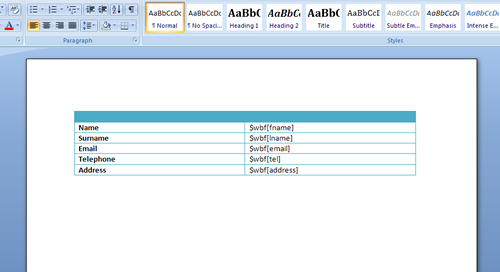 I have putted $wbf[fname], $wbf[lname], $wbf[email], $wbf[tel] and $wbf[address] in the cells I want to show dynamic data. These placeholders will be replaced dynamically with data. Now just save the document as RTF file. You go to "Save As" and save the file as "form.rtf". The database can be in any format, I will use Microsoft Access because it is the easiest for me. You can use MySQL, Oracle, MS SQL or even Microsoft Excel. Now save this file as "form.mdb"
I have inserted some records in this table. Finally we need a file which will be our webpage which takes the ID and gives us the RTF document. So we need to implement an input form for ID, and when submit is clicked then start downloading the new generated file. First let's rename the file "form.rtf" to "form.ic", "ic" is the extension for included files in WhizBase by the function $wbrinc. This is a very basic HTML form file, the only thing you must not forget is the name of the text field, it will be wbf_id, which I have already explained in previous tutorials. Save this file as "default.wbsp". Now we create another WhizBase file where we query the DB and include the RTF template file. Here we say to the browser that this documents type is not HTML so do not render it, we say it is MS WORD application type, so any popular browser will just download it to your computer. And you have now a ready script to make RTF reports easily. NurAzije is a PHP and WhizBase programmer, who at the time of article publication has been working in partnership with WhizBase company on several projects and very recently as an employee.